As most gym goers and body aesthetic enthusiasts would know, not all is fair in the gym world! Some can do as little as look at a dumbbell and pack on pounds of lean mass, whereas others must grind day and night, to no avail. A lot of it comes down to genetics. But, luckily for those who didn’t get a seat on the gains train, there are mass gainer supplements. These supplements are loaded with protein, carbohydrates and performance enhancers…. and pack quite the calorie punch! They are formulated specifically with lean mass gain, and general weight gain in mind. No two mass gainers are the same, and product choice would come down to your specific goals. In today’s article, we’re going to be doing a complete comparison of two products made by one of the market leaders, Optimum Nutrition. 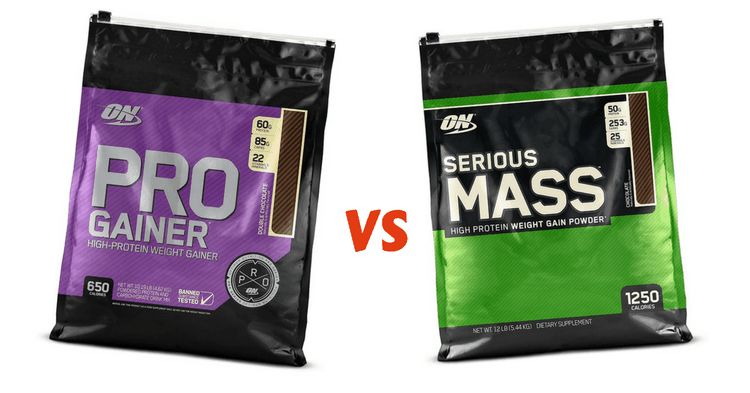 Read on to see how ON’s “Pro Gainer” and their “Serious Mass” compare. It’s time to get into the nitty-gritty of these two mass gainers! Below we’re going to have a look at some of the main features of a mass gainer; and how these two products stack up! The number of calories per serving is one of the most important features of a mass gaining supplement. After all, if you’re looking to gain lean mass or just weight in general, a surplus of daily calories is required; and is essentially the main reason one would consume a mass gainer. A supplement that delivers more than 400 calories is considered a “mass gainer”. The range of calories per serving varies significantly from one mass gainer to another and would be specific to your individual training and body goals. 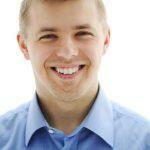 Click here to read more about the correlation between calories and weight gain. The Pro Gainer recommended serving size is 165g which contains a modest 650 calories. The Serious Mass recommended serving size is 334g and delivers a whopping 1250 calories per serve. With the Serious Mass containing almost double the calories of the Pro Gainer, it is a definite winner for someone looking to consume as many calories as possible through their shake and gain weight in the quickest way possible. However, this does not rule out the Pro Gainer by any means. 650 calories per serve is still that of a large meal and gets this product a place on the ‘gainer shelf’. The Pro Gainer would be better suited to someone wanting to do a more controlled gain, specifically of lean mass, without gaining much fat. All mass gainers contain protein and carbohydrates. But it is mostly the carbohydrate content that drives up the caloric intake per serve. The protein to carbohydrate ratio refers to the number of calories constituted by each ingredient, not their gram measurements. Though a lot of mass gainers are similar in the amount and blend of protein they provide, they can differ significantly when it comes to the amount of carbohydrates. And these two products are a superb example of that! 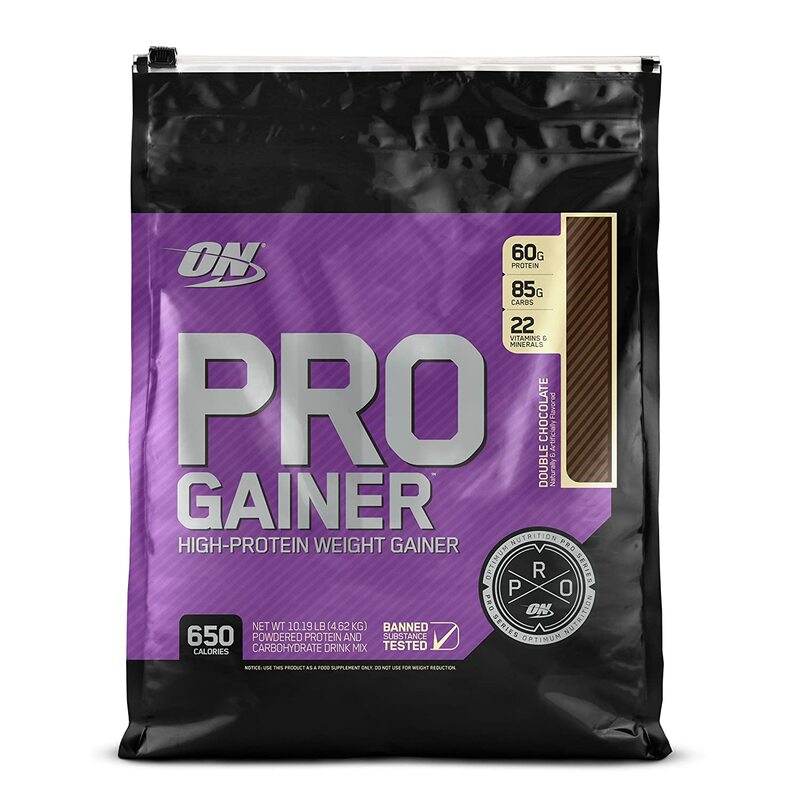 The Pro gainer has roughly a 1.3:1 protein to carbohydrate ratio with every 165g serving offering 60g of blended protein and 85g of carbohydrates. The Serious Mass has a monstrous 1:5 protein to carbohydrate ratio with every 334g serving offering 50g of blended protein and 252g of carbohydrates. Though the protein contents of these two products are very comparable; the carbohydrate contents are on opposite ends of the scale. As with the calorie feature, the Serious Mass would be a great choice if you are a hard-gainer in search of endless energy and gains (however they manifest). If you are looking to add calculated lean mass – the protein to carbohydrate ratio of the Pro Gainer would be better for your goals. Based on having a more compound protein blend, the Pro Gainer (only just) comes out on top; but, would this be a significant factor to the person who just wants to gain a few pounds fast? Probably not. Most high-quality mass gainer supplements contain lower amounts of fats than some of the cheaper and less advanced products, that use a lot of fat and sugar to increase the calories per serving. Often, you will see mass gainers containing anywhere between 3g to 10g of essential/good fats. These types of products contain fats for a variety of reasons, such as energy, hormones, mental clarity, fat burning benefits and for better absorption of macronutrients. The Pro Gainer contains 8.5g fat per serve. 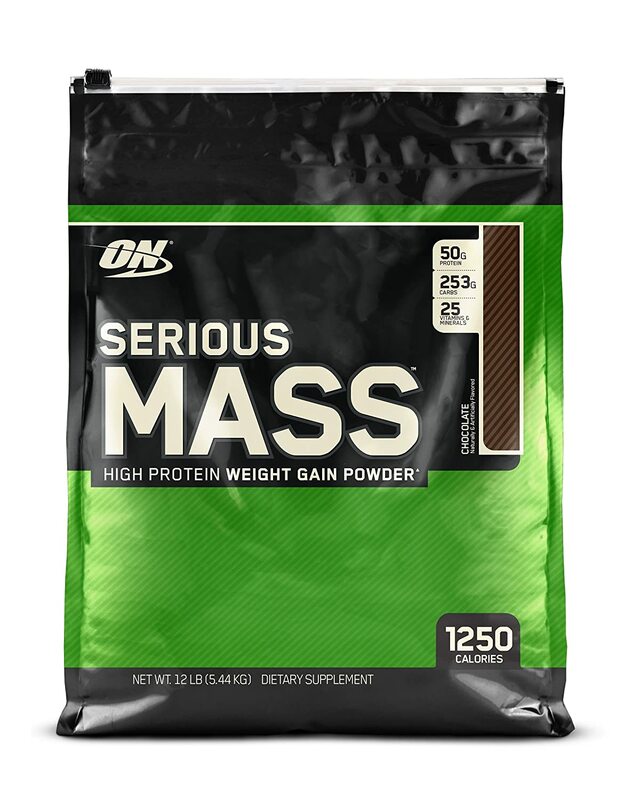 The Serious Mass contains only 4.4g per serve. Both mass gainers have a low-fat content. Having said this, the Pro Gainer contains almost double the amount of fat per serve than the Serious Mass. Considering the variance in carbohydrates between these two products though, it’s to be expected. The general rule of thumb is lower carbohydrate, higher fat and higher carbohydrate, lower fat – you get the picture! In my opinion, both products contain a suitable amount of fat in relation to their overall ingredient list. Unlike some of the pure whey isolate shakes that exist, mass gainers are known to be one of the best tasting supplements out there, due to their high carbohydrate content. They also tend to be easier to mix in terms of how they blend. I couldn’t find many reports of this supplement tasting bad, according to users of the product. It comes in a range of simple dairy flavors which seem to please. The serving size of 165g plus the recommended 450ml water is slightly too much for a 600ml shaker – this makes it kind of awkward. People love the way this one tastes; with 252g carbohydrates per serve, this comes as no surprise. It is available in a similar range of flavors to the Pro Gainer. However, the super-duper 334g serving size, plus the 700ml water it requires makes it incredibly difficult to mix. You could, of course, split it into two servings, in two separate shakers, but…. what a mission! There’s no doubt that both the Pro Gainer and the Serious Mass taste awesome. Mixability in terms of blending also seems to be foolproof. The mixability in terms of fitting it into a standard shaker bottle though? – not ideal for either product. If I had to pick one product based solely on taste and mixability (which would be a silly thing to do), it would have to be the Pro Gainer, as all you need to do is knock off a bit of the recommended water and it fits in a standard shaker – problem solved! As you can see from the above-detailed comparison, both the Pro Gainer and the Serious Mass tick the major mass gainer boxes, however in different ways. Below you will find the top features of both products. Firstly, I hope you found this article helpful in detailing the differences between these two mass gainers. The reality of the situation is that neither one of these products is superior to one another. The Pro Gainer excels where the Serious Mass lacks and the Serious Mass excels where the Pro Gainer lacks. It all comes down to individual goals – but I’m happy to tell you, that whether you’re looking for some lean gains or just wanting to get big fast, there’s a product here for you. The Serious Mass has a standout formula for hard gainers and would be a good choice for someone looking to add mass fast, or someone who doesn’t mind gaining a bit of extra fat during the process. For example, someone transitioning between “bulking” and “cutting” phases. On the other hand, if you have a sluggish metabolism and want to gain lean muscle mass without gaining excess fat, the Pro Gainer would be a great choice. It’s protein / carbohydrate / fat ratio is well thought out, and it’s serving size and calorie content make it a digestible post-workout shake. If you’re unsure about your specific calorie requirements for your goals, you can calculate it here. As you can see, there are two winners in this comparison! Let us know about some of your go-to mass gainers in the comments section below!